Momen - the 2014 Grasshopper Cup runner-up - was appearing in a third successive PSA Tour final for the first time in his career and had already beaten ElShorbagy twice this month, first in the semi-finals of the PSA World Championships and also two weeks ago at the same stage of the Canary Wharf Classic. "I’m really proud to win it," said ElShorbagy afterwards. "This is the third time I’m coming back here, and a lot of great names have won this trophy like Gregory Gaultier and Ramy. To put my name besides the greats of squash is an honour, and I’m really proud to lift this trophy in front of this crowd. They’ve been amazing all week, and I’m really glad I won at the end. "He [Momen] has been playing the squash of his life this season, he made three finals this month, and I know how hard it is to back it up after every tournament. He should be really proud of what he achieved this month. "The second game was crucial, and I thought that if I could go 2-0 up it would have been a mountain to climb. I’m really glad I was able to finish that off and win the title. It’s been an up-and-down season for me, but I wanted to show what I can do and play well. "This season is far from over for me. There is still the World No.1 spot to play for this season, I’m going to be trying to get that spot back by the end of the season, and I’m going to give it my all." 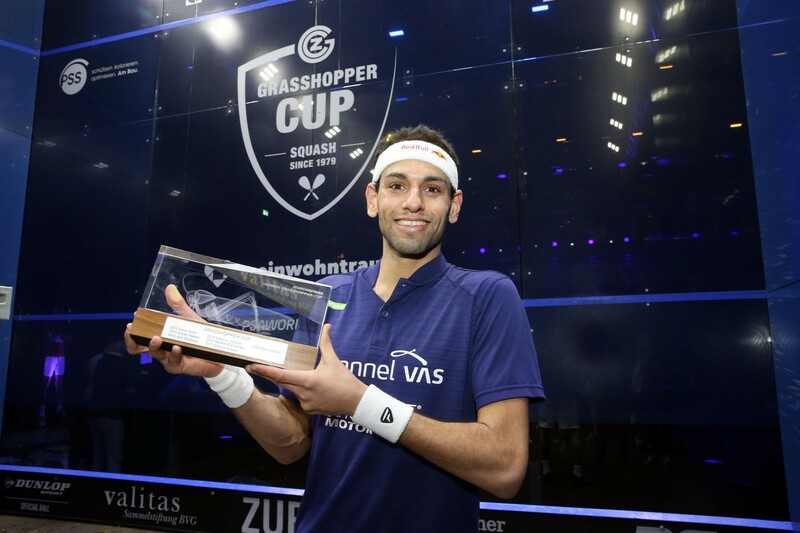 World No.2 Mohamed ElShorbagy and World No.3 Tarek Momen will contest the final of the 2019 Grasshopper Cup, PSA World Tour Gold tournament after they got the better of fellow Egyptians Karim Abdel Gawad and Mohamed Abouelghar in their semi-final fixtures at Zurich’s Halle 622 earlier today. ElShorbagy will appear in his second successive Grasshopper Cup final after winning a gripping battle by an 11-7, 9-11, 12-10, 11-6 scoreline. Known on tour as ‘The Beast’, ElShorbagy put in a performance befitting that moniker as he held his opponent’s shot-making skills at bay. Gawad came into the semi-finals after an emphatic 3-0 win over Rösner in the previous round, while he beat ElShorbagy en route to winning the Black Ball Open in December. Gawad was able to stick in the match for the most part as he recovered from a game down to level, while he came within a whisker of winning a crucial third game after weathering a storm to go game ball up. 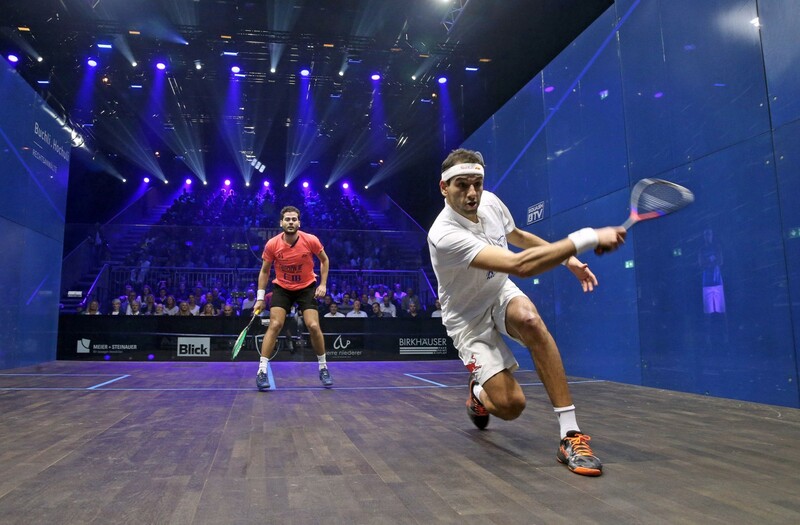 Two strokes and a tin followed in quick succession though to hand the initiative back to ElShorbagy, and the 28-year-old blitzed to victory in the fourth against a tired-looking Gawad to book his spot in the title-decider. “I’m very proud of this performance,” said ElShorbagy. “I was up 9-6 in that third game, it was a very crucial game, and at that point I was thinking more about winning it, rather than how I was going to win it. That’s when the emotions take control of your brain, but luckily for me he gifted me that game with an error and a stroke. The day’s other semi-final saw Momen make it nine successive wins over World No.8 Abouelghar as he cruised to an 11-4, 11-6, 11-8 victory. 24 hours ago, Momen could barely stand up after battling to a hard-fought quarter-final triumph over India’s Saurav Ghosal, but he backed it up superbly as he dominated proceedings today at Halle 622. In contrast, Abouelghar was coming off the back of a sensational 3-1 win over World No.1 Ali Farag in the previous round, but he looked like a different player as he never really got going against Momen. Momen had already beaten Abouelghar four times this season, with their last two meetings going the distance to five games, but he was a class apart in Zurich. He dictated the tempo of the match and hit his targets perfectly to reach a third PSA Tour final in a row for the first time in his career. “ To get a 3-0 win is just spectacular," Momen said. "I know Mohamed had a tough one yesterday, I think mentally more than physically. I believe it would have been hard to back it up, I’ve been in this situation a few times, and I know taking out the World No.1 can take a lot out of your mind. “This is my fifth time here in Zurich, in the previous four events I’ve had a different result in every single one. I’ve made the final, the semi-finals, the quarter-finals and the last 16, so hopefully this time it will be a different result as well." Momen will appear in his first final here since 2014. Momen will look to build on back-to-back wins over World No.2 ElShorbagy after beating him in the semi-finals of both the PSA World Championships and the Canary Wharf Classic. ElShorbagy, meanwhile, will look to improve on a final defeat to compatriot Ramy Ashour last year. The finals take place at 15:30 (GMT+1) will be shown live on SQUASHTV (rest of world) and Eurosport Player (Europe only). A women’s exhibition tournament also took place today at Halle 622, with World No.3 Nour El Tayeb and World No.4 Camille Serme beating World No.27 Nele Gilis and World No.5 Joelle King, respectively. Gilis and King will go head-to-head at 13:30, while El Tayeb and Serme will contest the exhibition final an hour later. Matches will be shown live on SQUASHTV (rest of world), the official Facebook page of the PSA World Tour and via PSA SQUASHTV on YouTube. 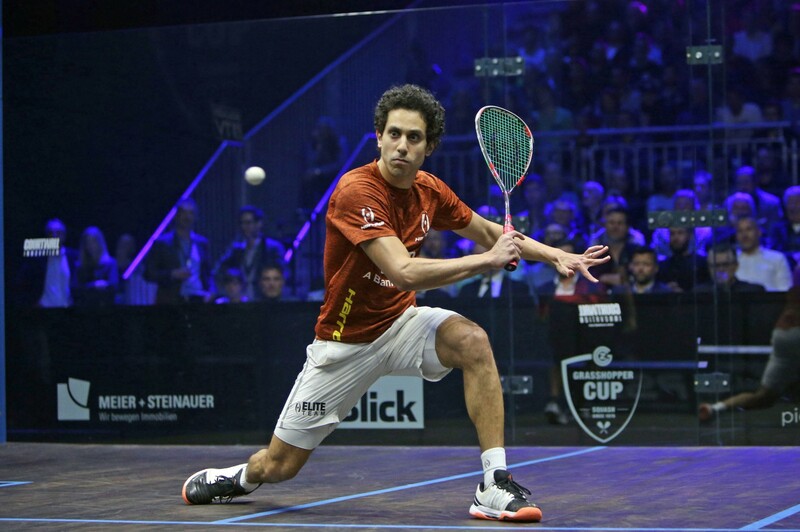 Egypt’s World No.8 Mohamed Abouelghar sent World No.1 and compatriot Ali Farag out of the Grasshopper Cup, PSA World Tour Gold tournament as Egyptians dominated quarter-finals day at Zurich’s Halle 622. 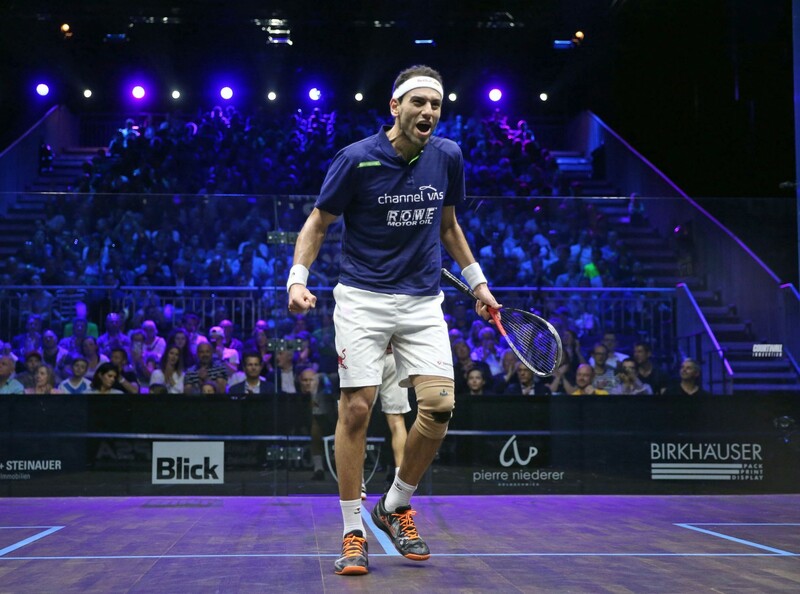 Farag became World Champion and World No.1 earlier this month and came into this tournament having reached five PSA Tour finals in a row. But his 11-match unbeaten run came to an end against compatriot Abouelghar, who won 11-9, 5-11, 11-7, 11-9 after 51 minutes of high-quality squash. Some sublime drops and breathtaking retrievals made for a spectacular conclusion to the day’s play – with Abouelghar prevailing to book a semi-final spot against World No.3 Tarek Momen. “I’ve been knocking on the door of the top players since the beginning of the season, and I’ve never been able to turn it around my way,” Abouelghar said afterwards. “It’s been a long process, and I’ve learned a lot from my previous matches. Thankfully, I have a great team around me that helps me learn from my losses rather than backing down. I’m happy with the way I dealt with it until the end, I never gave up, and I’m very happy to be through to the semis. All four semi-final spots at this tournament will be taken up by Egyptians for the first time in history, after Momen, World No.2 ElShorbagy and World No.4 Karim Abdel Gawad all claimed wins to reach the last four. Momen came from behind to record a 3-1 win over India’s Saurav Ghosal as he took one step closer to a third successive PSA Tour final. 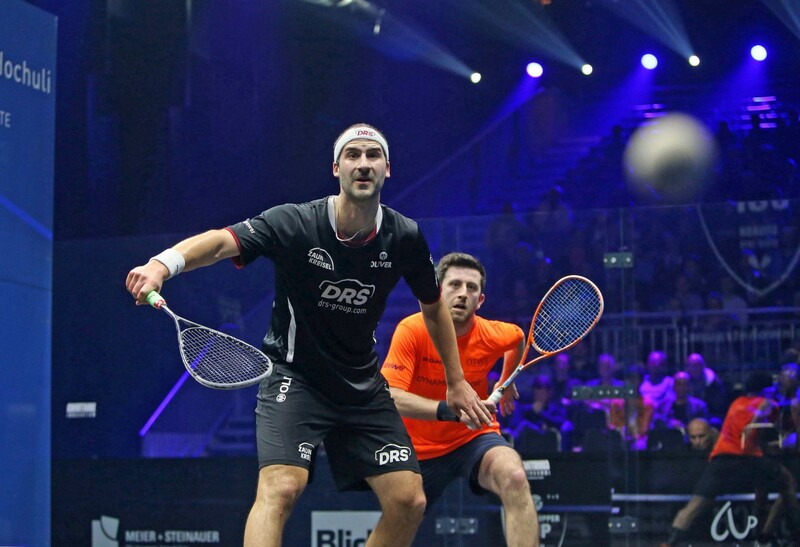 The 31-year-old has reached the title deciders at the PSA World Championships and the Canary Wharf Classic this month and beat Ghosal by a narrow 9-11, 11-6, 11-6, 14-12 margin to earn his semi-final spot. He will go up against Abouelghar for the fifth time this season, with Momen winning every single time. “I don’t think we’ve ever played a match that went smoothly, it’s always really tough,” Momen said. ElShorbagy and Gawad will contest the other semi-final after respective wins against Colombia’s Miguel Rodriguez and Germany’s Simon Rösner. 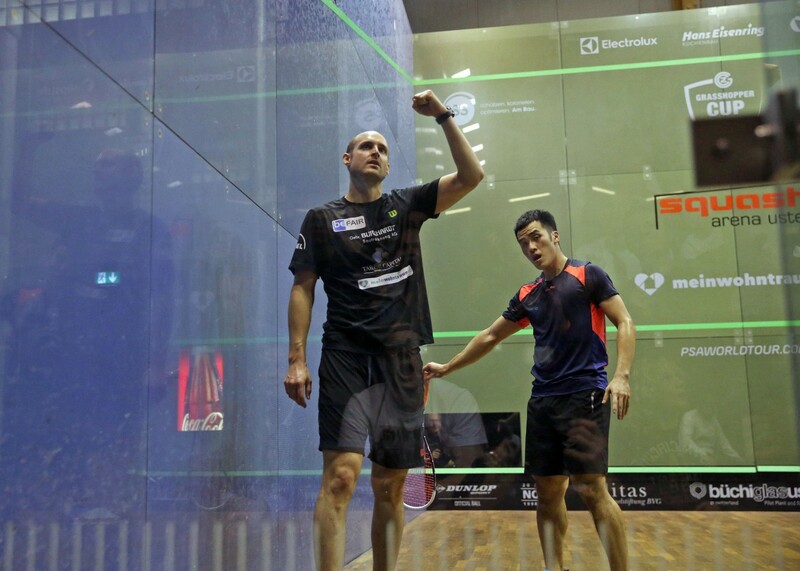 Rodriguez was making his 450th PSA Tour appearance and beat ElShorbagy to win the British Open last May. 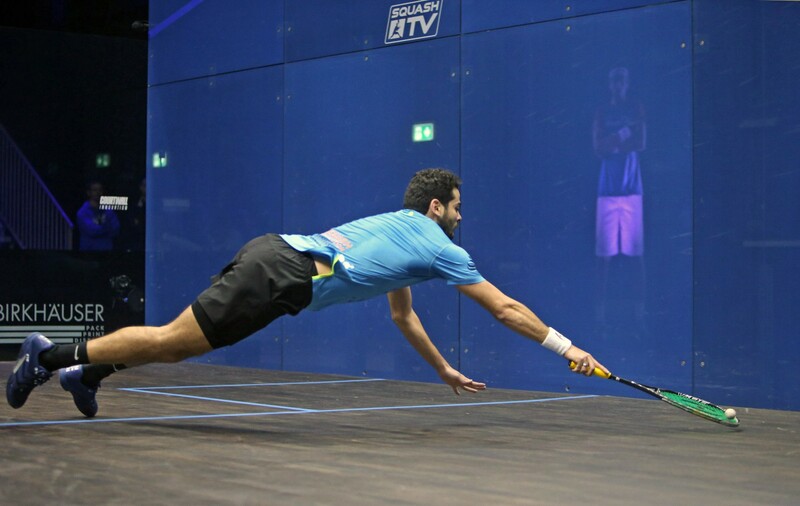 The Egyptian was sublime in Zurich though as he put in a powerhouse performance to win 11-4, 11-9, 11-5. 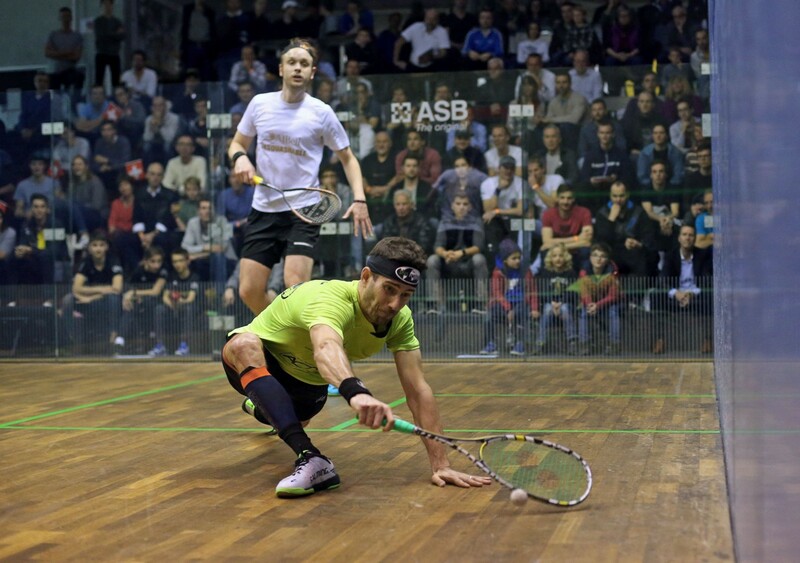 “He won the British Open for a reason, he played really well that week,” said ElShorbagy. 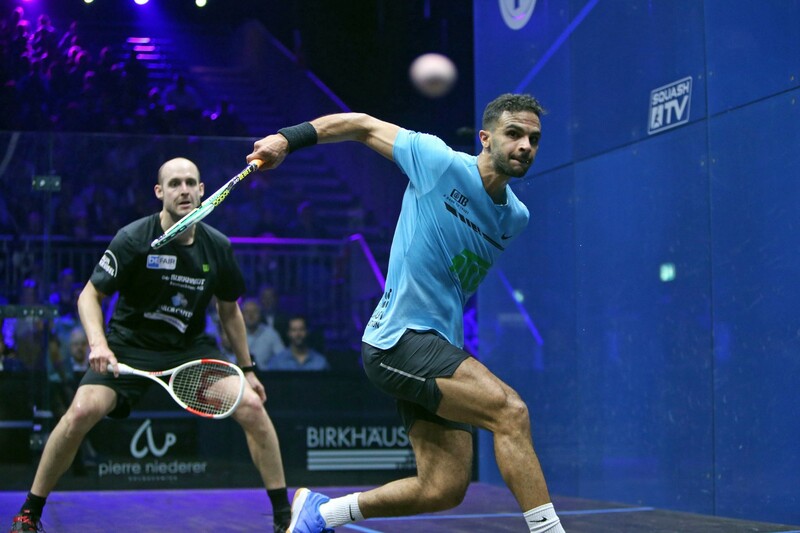 Gawad, who like ElShorbagy is a former World No.1 and former World Champion, dismantled World No.5 Rösner after putting on a brilliant display of attacking squash at Halle 622. The 27-year-old is traditionally a slow starter, but he found his rhythm right from the off against Rösner and hit some stunning winners throughout the match as Rösner had no answers to Gawad’s brilliance. Gawad and ElShorbagy will line up against each other for the third time this season. Gawad beat his fellow Egyptian en route to winning the Black Ball Open in December, while ElShorbagy achieved wins at the J.P. Tournament of Champions and the Oracle NetSuite Open. "I tried to play good squash today, I’m really happy it worked, and I’m really happy to win in three against the World No.5 in this tournament," Gawad said. "I’m expecting a very tough match [with ElShorbagy], Mohamed’s results and his record speak for itself. We’ve battled a lot since we were juniors and under 11 years old, so tomorrow I have to focus and play my best squash without any pressure. Hopefully I can play as well as I did today." The semi-finals of the Grasshopper Cup will take place at 19:00 on Saturday March 30. Action will be shown live on SQUASHTV (rest of world) and Eurosport Player (Europe only). A women’s exhibition tournament, featuring World No.3 Nour El Tayeb, World No.4 Camille Serme, World No.5 Joelle King and World No.28 Nele Gilis, will take place at 16:00 and will be shown live on SQUASHTV (rest of world), the official Facebook page of the PSA World Tour and via PSA SQUASHTV on YouTube. Home hero Nicolas Mueller bowed out of the Grasshopper Cup on day three of the PSA World Tour Gold tournament after falling to Egypt’s Mohamed Abouelghar in straight games inside Zurich’s Halle 622 earlier today. Zurich-based Mueller was cheered on by his home crowd, with every winner he hit throughout the match greeted with a roar from the spectators, while a multitude of Swiss flags were on show in the stands. But he was unable to overcome Abouelghar as the World No.8 won the battle at the front of the court to complete an 11-8, 11-8, 11-9 victory in 37 minutes. “I don’t think I’ve ever seen so many Swiss flags in one day,” Abouelghar said afterwards. “I’m really happy to be back playing in Switzerland, it’s a special place for me and I’ve always played well. Even though I was playing against Nicky and I had all the crowd cheering against me, I still enjoyed it and it was a pleasure to be part of that tonight. “I’ve played Nicky before, and I’ve watched him a lot. We both play the same way, we like to go short and play an open game, and in the critical points I thought I had to stick to the side wall more and play less risky squash. I’m happy with the way I dealt with it at the end of each game and happy to be through in three." Abouelghar will line up against World No.1 and World Champion Ali Farag in the quarter-finals. 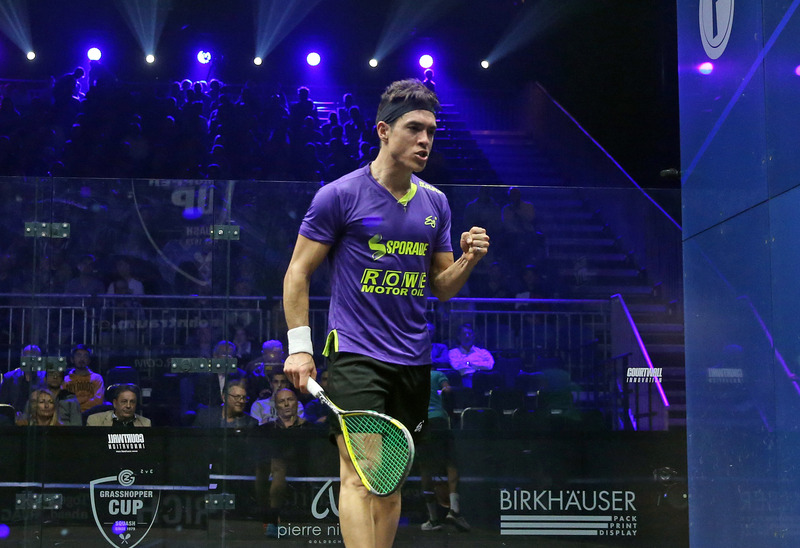 Farag came back from a game to see off Welshman Joel Makin in a thrilling four-game encounter which saw the pair walk off court to a standing ovation. 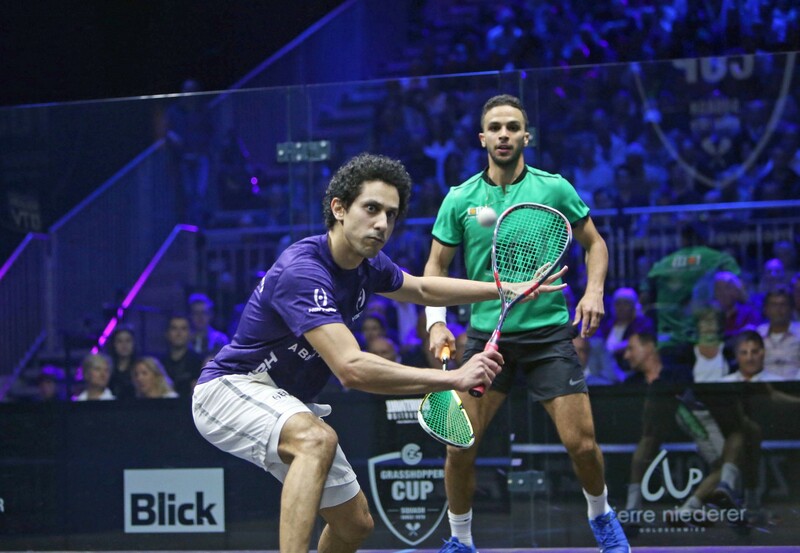 Some gruelling rallies and incredible feats of athleticism from both players was on show throughout the 64-minute contest as the contrast of playing styles made for a fascinating encounter, with Farag’s deft touches and free-flowing movement clashing with Makin’s tenacity and speed. They sent the crowd wild in the opening game after contesting a gladiatorial 100+ shot rally, which totalled over two minutes in length, with Makin prevailing en route to taking the first game. 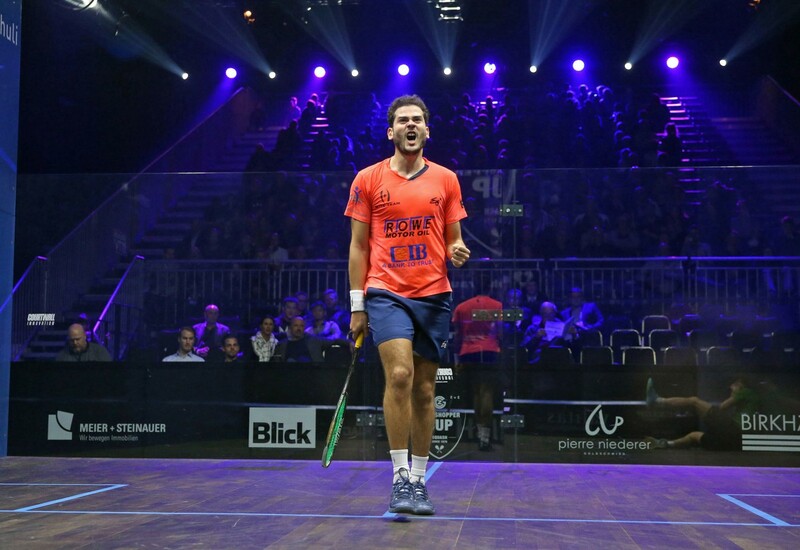 Farag, the 2017 runner-up, has won both of the PSA Tour events he has appeared at in 2019 though - including the PSA World Championships - and he managed to get the better of Makin in the next three games to book his last eight berth. “Now that I’m here, I feel how much I missed playing this tournament last year,” said Farag. “The Grasshopper Cup has grown from a $25k, to a $35k, $50k, $70k and now here it is at a Gold level. [Tournament Promoters] Steve [Buchli] and Claudia [Schurmann] do a fantastic job making us feel at home from the very first second we step on court, and the crowd always makes us motivated to play." World No.3 Tarek Momen and India’s Saurav Ghosal also progressed to the quarter-finals after beating Frenchman Mathieu Castagnet and England’s Declan James, respectively. 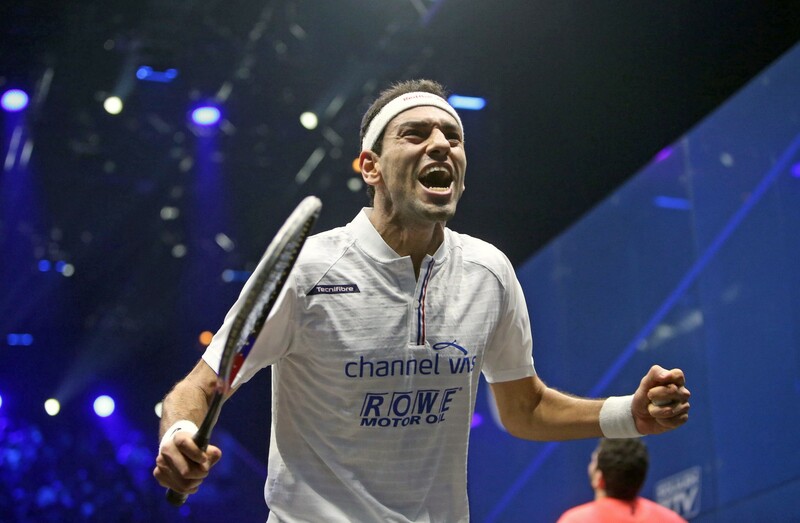 Momen, the World Championship runner-up, put on a clinical masterclass to win 11-5, 11-7, 11-4 in 34 minutes. 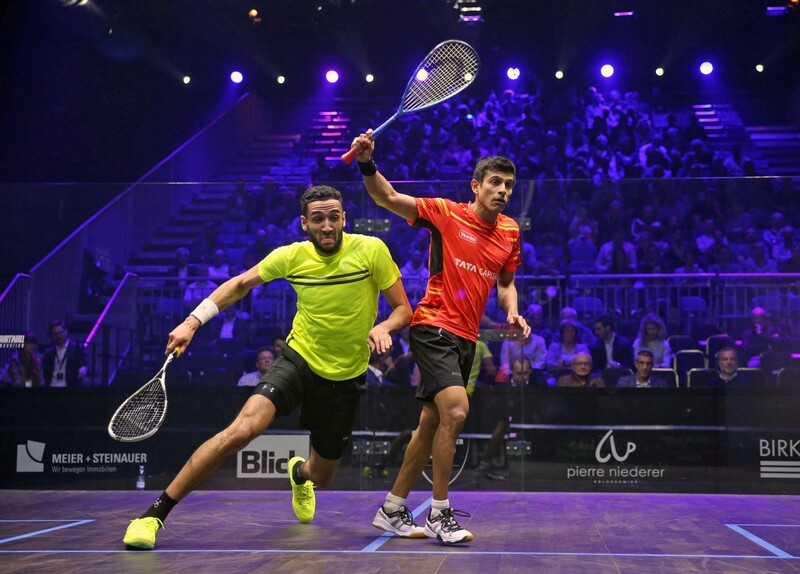 Momen is aiming to reach his third successive PSA Tour final after runner-up finishes at the World Championships and the Canary Wharf Classic. “I’m quite pleased with the way I played,” Momen said. “As tough as back-to-back tournaments are on the body, they get you in the zone and make you really sharp. From the word go, I felt like I was just playing a tournament yesterday. It’s a good thing and a bad thing, but I’m trying to take the positives out of it." Ghosal recorded a hard-fought 3-1 triumph over World No.20 James, winning 11-7, 12-10, 7-11, 11-5. A crucial second game went the way of Ghosal after he recovered from 6-0 down and then 10-8 down, and despite dropping the third, the World No.12 held firm in game four to earn his quarter-final spot. “[The second game] was obviously a key moment because when you’re coming back from 6-0 down, it’s a big mental hurdle for him to cross,” said Ghosal. The quarter-finals take place on Friday March 29 and play begins at 17:30 (GMT+1). Action will be shown live on SQUASHTV (rest of world), Eurosport Player (Europe only) and the official Facebook page of the PSA World Tour. Colombia’s Miguel Rodriguez and Egypt’s Karim Abdel Gawad narrowly avoided surprise defeats on day two of the Grasshopper Cup as they claimed 3-2 wins over World No.14 Zahed Salem and World No.24 Max Lee, respectively, at Halle 622 in Zurich, Switzerland. 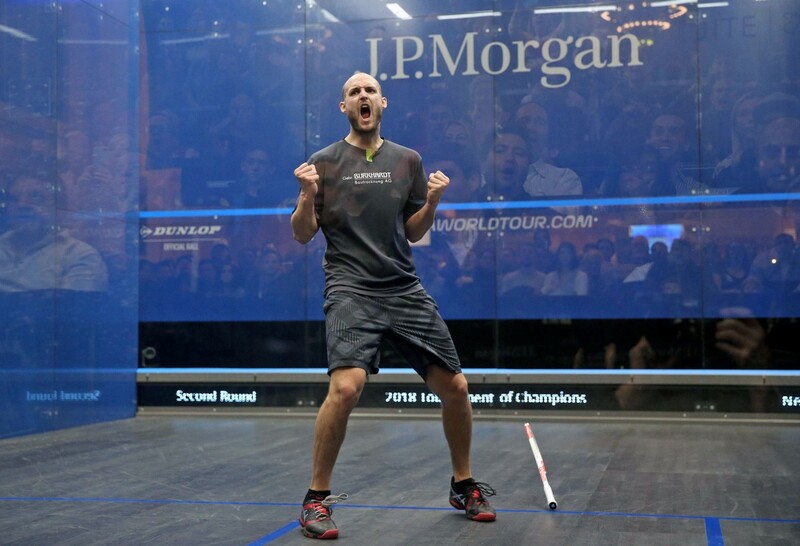 33-year-old Rodriguez overturned four match balls as he won 8-11, 11-6, 9-11, 14-12, 11-5 triumph against Egypt’s Salem to reach the quarter-finals of the PSA World Tour Gold tournament, where he will play top seed and last year’s runner-up Mohamed ElShorbagy in the last eight. "I knew it was going to be very tough, Zahed has been playing very well and I’ve been struggling a bit," said Rodriguez afterwards. "It’s always difficult coming to play the first match coming from Colombia, but there are no excuses, we fought until the end and I’m pretty happy with the way I fought back in the third game when I was down by those match balls. "I was just focusing on playing and giving everything, and fortunately I won that fourth game and had the confidence to play in the fifth." 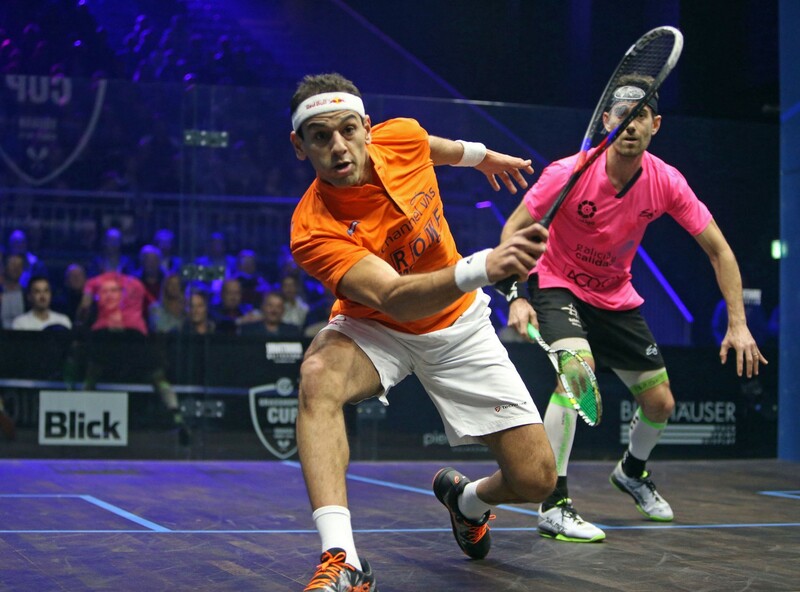 Rodriguez and ElShorbagy will meet in a repeat of the 2018 British Open final, where Rodriguez prevailed. ElShorbagy has won all three of their fixtures since then though and he earned his spot in the last eight courtesy of an 11-7, 11-6, 11-7 victory over Spain’s Borja Golan. 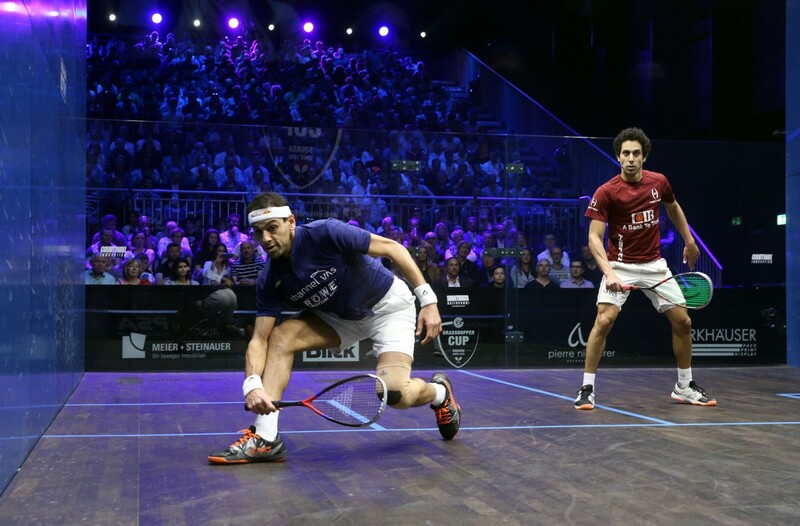 ElShorbagy claimed a narrow win over Golan two weeks ago at the Citigold Canary Wharf Classic, with that match played using a best-of-three games scoring format. 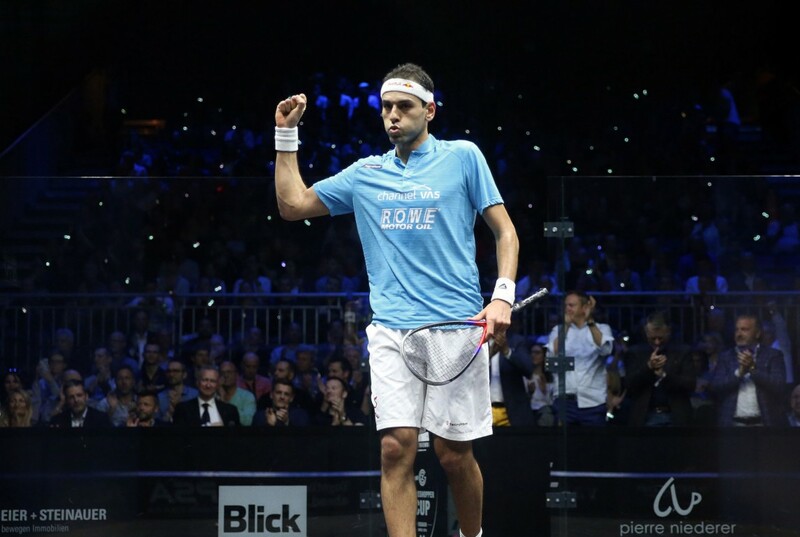 The traditional best of five format is being used in Zurich though, and ElShorbagy put in a composed display to earn his spot in the next round. “I think this is the only tournament on the calendar that I haven’t won yet," said ElShorbagy. 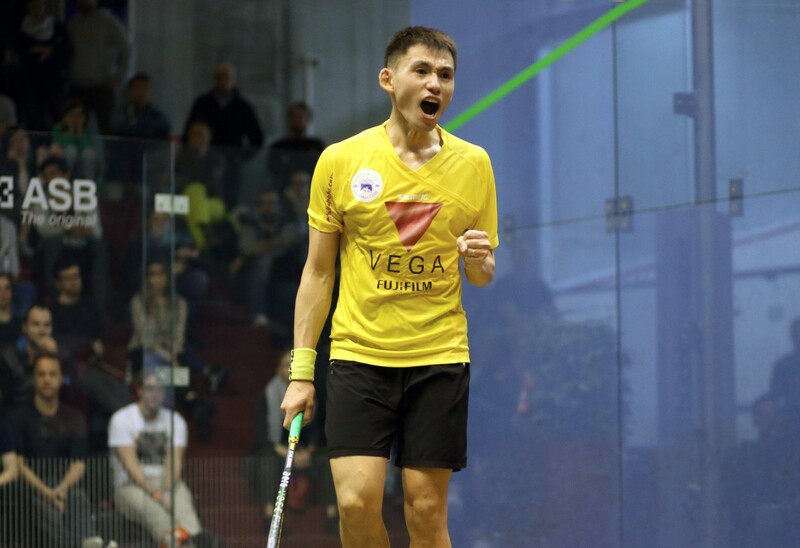 Meanwhile, former World No.1 Gawad ousted Hong Kong’s Lee in five games as he twice came back from a game down to advance to the next round, winning 10-12, 11-6, 9-11, 11-4, 11-7. Gawad twice fell a game behind, which left him staring down the barrel of a second successive upset after a shock defeat to compatriot Youssef Soliman during last month’s PSA World Championships in Chicago. The 27-year-old kept his composure to draw level on both occasions and he held off Lee in the decider to advance to the next round. “Playing Max is always very tough,” said Gawad. “Most of the time it’s a five setter and, for me, he is one of the best movers on court. It was very tough today, especially when you’re not playing your best squash and you’re being passive with your winners." His quarter-final opponent will be Germany’s Simon Rösner after the World No.5 defeated England’s Daryl Selby 11-7, 11-8, 11-6 to record his sixth successive win over the 36-year-old. Rösner will aim to avenge a 3-0 defeat to Gawad in the quarter-finals of the J.P. Morgan Tournament of Champions in January. “We’ve played a few times now and it’s always tough, even though he played a five setter yesterday [against Australia’s Cameron Pilley],” said Rösner. Round two continues on Thursday March 28. Play starts at 17:00 (GMT+1) and will be shown live on SQUASHTV (rest of world), Eurosport Player (Europe only) and the official Facebook page of the PSA World Tour (excluding Europe and Japan). 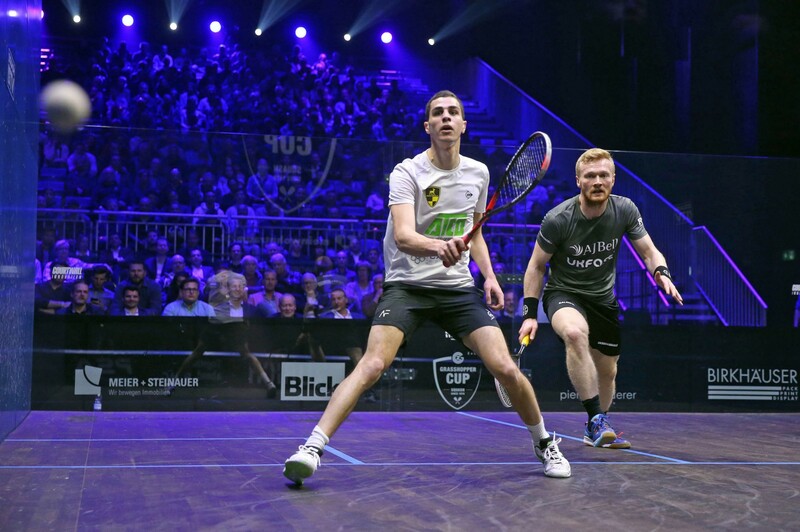 Swiss No.1 Nicolas Mueller got off to a winning start at the 2019 Grasshopper Cup as he overcame Hong Kong’s Tsz Fung Yip by a 3-1 scoreline earlier today to reach the second round of the PSA World Tour Gold tournament. 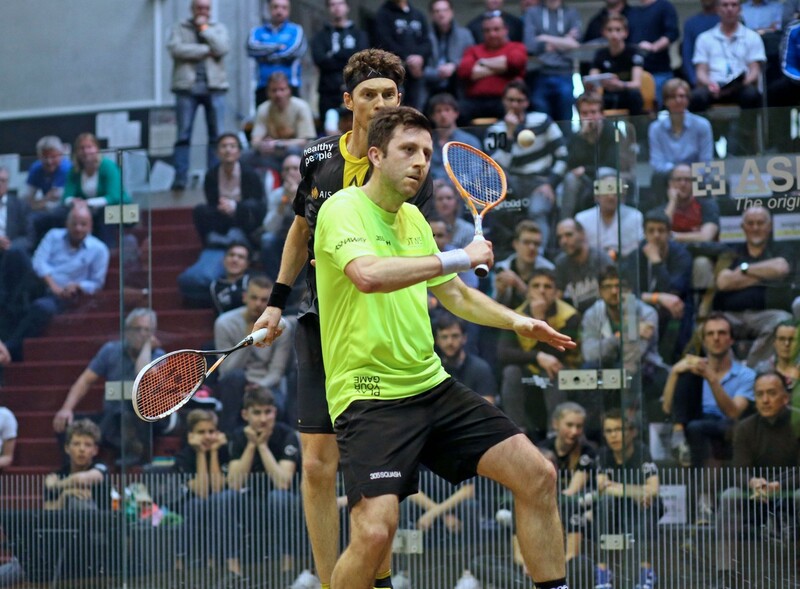 The entirety of the first round took place at Squash Arena Uster today, and Zurich-based Mueller booked his place in the last 16 courtesy of an 11-6, 7-11, 11-6, 11-7 triumph over Yip. 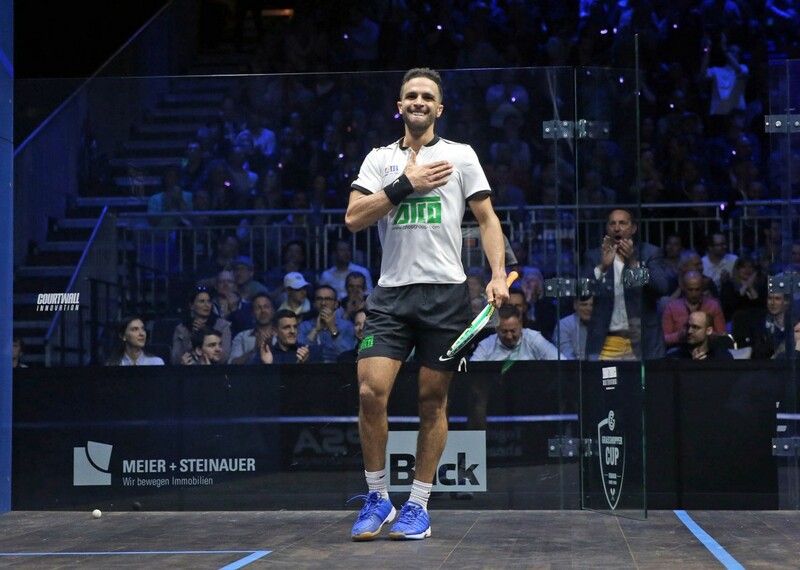 The World No.28 was backed to the hilt by partizan home support, with every winner greeted by a crescendo of cheers as the spectators got behind their man, and he will play World No.8 Mohamed Abouelghar for a place in the quarter-finals. “I’m very pumped,” said Mueller afterwards. “I’ve been playing well over the last two or three weeks, and I was glad I peaked at the right moments. This season hasn’t been the best, but I’m very happy to be here and happy to play like this in front of my home crowd, it was amazing. Mueller’s younger compatriot, Dimitri Steinmann, was also in action against Hong Kong opposition as the tournament wildcard fell in four games to World No.24 Max Lee, who will now go on to play former World No.1 Karim Abdel Gawad in the next round. Like Mueller, 21-year-old Steinmann had the home crowd in his corner, and he put in a tenacious performance as he played well above his current World Ranking of No.70. He drew level after conceding the opener, but Lee’s experience came to the forefront in games three and four as he closed out the win in 60 minutes. “I know the feeling of having the crowd behind the players because at the Hong Kong Open, the crowd is behind all the Hong Kong players," Lee said. The longest match of the day was contested by two veterans of the sport as England’s Daryl Selby and Australia’s Cameron Pilley, both 36, played out a gripping 85-minute battle, which went the way of the former. Selby and Pilley are close friends - even co-hosting the squash podcast ‘Comments from the Couch’ together - and they put on an enthralling spectacle which went all the way to five. Both players held three match balls each in the decider, and it was Selby who was able to convert to record an 11-6, 9-11, 11-4, 7-11, 16-14 victory. “ I think I was a little bit lucky at the end, to be honest,” said Selby. “You could see how well he was moving by the end of the third and fourth game, he was picking everything up at the front and putting me under a lot of pressure. Sometimes you have to just grind it out and get a win on the board. Somehow, I found a way to win." Selby will play No.4 seed Simon Rösner in the next round, while top seed and 2018 runner-up Mohamed ElShorbagy will line up against Spain’s Borja Golan after Golan took just 23 minutes to see off England’s World No.15 James Willstrop. Willstrop led their head-to-head record 10-3 coming into the match, but the Englishman had suffered from illness in the build up to the tournament and looked off the pace as he never really got going. Golan, meanwhile, was clinical and accurate with his shots in all four corners of the court as he recorded his first win over Willstrop since 2013. “It’s so difficult to win 3-0 against James, he’s such a good player,” said Golan. Golan and ElShorbagy will meet for a second tournament in a row after the latter beat the Spaniard in the Citigold Canary Wharf Classic two weeks ago. There were also wins for Welshman Joel Makin, England's Declan James, France's Mathieu Castagnet and Egypt's Zahed Salem. The second round begins on Wednesday March 27 as the likes of ElShorbagy, Rösner, Gawad and Colombia’s Miguel Rodriguez begin their tournaments after receiving byes through to the last 16. Halle 622 will host the rest of the Grasshopper Cup from the second round onwards and action will be shown live on SQUASHTV (rest of world), Eurosport Player (Europe only) and the official Facebook page of the PSA World Tour. Mueller faces Hong Kong’s Tsz Fung Yip in round one next week and says the Grasshopper Cup - which is the biggest PSA Tour event in Continental Europe - is a real highlight for him on the calendar. "I’m very privileged to be able to play in front of a sold out home crowd, who are swinging Swiss flags," Mueller said. "It’s definitely goosebump material. I love playing in front of a big crowd, even more so when the majority are cheering for you. I’ve played some of my best matches here, so it must give me a big boost. "I’ve played this event in multiple locations, growing with the tournament, from a $25K prize fund a few years back to now the biggest tournament in Continental Europe.. the new location is perfect, with the VIP section above, it’s very spacious, has a sponsors village and the hotel is just a two-minute walk away." He said: "My season hasn’t really been the best. My summer preparation was non-existent due to illness and injuries, and that definitely didn’t help the process. At least now I feel like I’m back to 100 per cent finally, just in time for the main event. "If I start beating these guys [Ashour, ElShorbagy, Rösner] that means I’d be amongst the top five in the world. Thats the quality you need to beat players like that. I definitely have to believe in beating them and the crowd definitely helps with that." Eight of the world's top 10 players - including World No.1 Ali Farag, top seed Mohamed ElShorbagy, and his younger brother, 2016 champion Marwan, will appear alongside Mueller in the draw. Current World No.1 and World Champion Mohamed ElShorbagy - who finished as runner-up to fellow Egyptian Ramy Ashour last year - tops the draw ahead of 2017 runner-up Ali Farag, World No.3 Tarek Momen and World No.4 Simon Rösner. "We’re looking forward to welcoming a world-class draw to Zurich for what promises to be the best ever edition of the Grasshopper Cup," said Tournament Promoter Steve Buchli. "The Grasshopper Cup has long held a reputation as one of the most prestigious tournaments in Europe, and spectators at Halle 622 can look forward to six days of high-octane action."